Crab Cakes get so abused. Tender sweet succulent crab; why do so many ruin the delicate flavor by adding red or green peppers to the mix? When I think of crab cakes, I think of the delicious flavor of crab, not a nasal hit of red or green peppers. While I love peppers, they do have their place. In my opinion, that place is not in a crab cake. What is the star of your dish? Is it the crab? How much did you pay for the crab? Usually a lot of money or labor if you cleaned your own crabs. Why would you want to hide the star of your dish with the pungent flavor of red or green pepper? Peppers have a dominate flavor, they overpower everything. Which is why they are the stars in the dishes they are featured. Stuffed peppers, sausage and peppers, red pepper hummus, roasted pepper salads, great dishes with strong dominate flavors. If you didn’t guess already, adding peppers to delicate crab meat is a pet peeve of mine. I feel strongly about it. If you like peppers in your crab cakes, fine, I’d ask you though if you really know what crab tastes like. Enough of that rant, on to the crab cakes! Crab, any kind of crab, has a delicate flavor. Enhance the flavor with a dab of smooth Dijon mustard, sautéed shallot, roasted garlic and sliced scallions or chives and lemon zest. Hold the mix together with an egg and coat the outside of each formed crab cake with a layer of panko bread crumbs and you have an amazing cake for either an appetizer, entrée or salad. How to and the recipe are below. Crab comes in many forms. You can purchase live blue crabs or king or queen crab legs and boil your own for a great outdoor dinner party. Colossal Lump: Very large white, unbroken pieces of crab. Jumbo Lump: largest white pieces of crab meat from the body portion adjacent to the back fin appendage. may contain broken pieces. Back fin: A blend of large lump pieces and special meat. Special: Flake white meat from the body portion of the crab. Claw: This meat is from the crab claws. It is darker in color but sweeter in flavor. 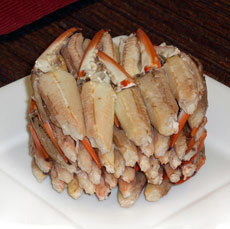 Cocktail Claws: Claw meat intact on the claw with the outer shell removed. Colossal Lump is typically the most expensive. If you think of the labor that goes into cleaning a crab, you would understand why. The other night there was a pasteurized can of jumbo lump in my fridge. We had crab in salads and make crab cakes. 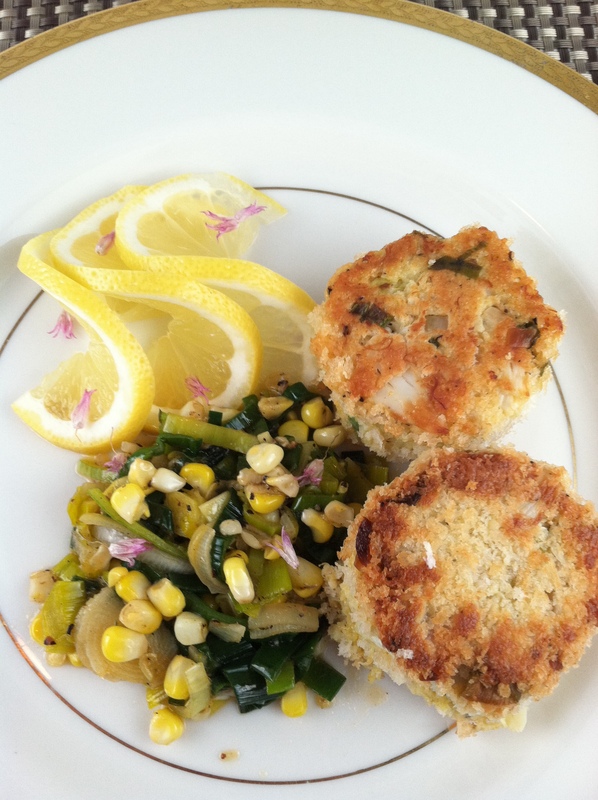 There were leeks and corn in the fridge too so I sautéed a nice side to go with the crab cakes. Heat a saute pan over medium heat, add oil, shallot and garlic, stir. 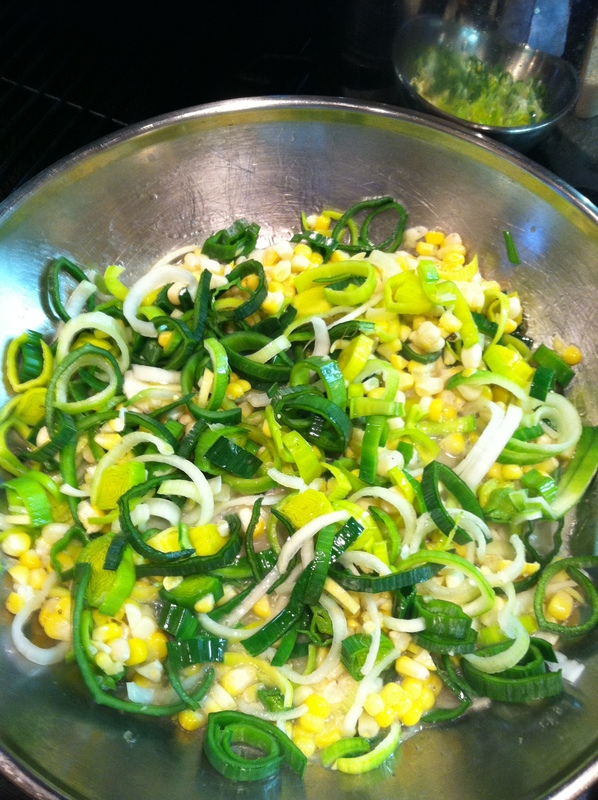 Add rinsed leeks and corn, saute 2-3 minutes, add white wine and simmer until the pan is nearly dry. Taste and season with salt and pepper. Set aside and keep warm. To remove any cartilage that may still be in the crab meat, place the meat on a parchment lined sheet pan, place it in a 350°F oven for 2-3 minutes. Any cartilage will turn bright white or red and can easily be picked out. Working in a restaurant, the sheet pan method is used to quickly identify any unwanted cartilage. This method also preserves the shape of the meat if using precious lump meat. 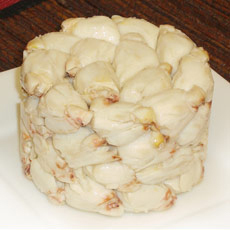 High volumes of crab meat can be processed quickly this way. Combine everything in a large bowl except the crab, add the crab meat last so it does not get broken up too much. Carefully, take a small handful and shape the crab cake between your thumb and forefinger as if you are making a hand gesture to say OK. This makes the sides and size consistent. Roll each cake carefully in breadcrumbs. Heat a saute pan with 2 tablespoons of oil. Cook the crab cakes until golden brown on each side. If you move them very little while cooking they won’t fall apart. Serve with lemon, sautéed leeks and corn on the side. This entry was posted in Cooking, Recipes, What every good cook should know and tagged Crab, Crab cake, Crab meat, dinner, food, Sautéing. Bookmark the permalink. I like the leeks/corn combo. Leeks are such a great veg…. I love crab cakes and what we call rissoles here in Australia. 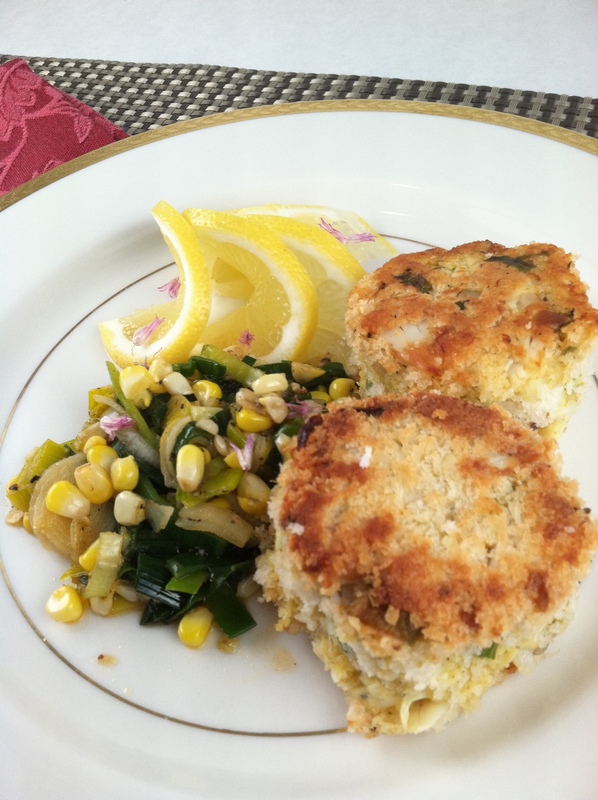 totally love your crab cakes and I wonder if they would be something for the whole family? still holding on on crustaceans (they say they are heavy on young livers or something like that) but these look so kid friendly and good. thanks for all the info, btw.